Hi everyone! Here is Part II (see Math Games Library, Part I) which will discuss the rest of the library: game directions and playing cards. The directions are mostly for my convenience, since the kids seem to remember them more than I do! I made a binder for each grade level and matched it to the color of a particular grade level basket. This image show the games for grade 5, listed in alphabetical order. I also listed the basket numbers, to make it easier to find specific games when needed. 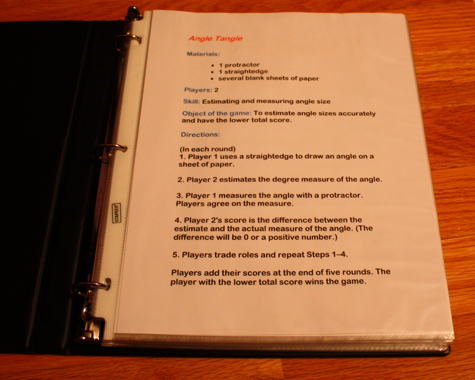 Then I just put the game directions in sheet protectors within the binder, to keep them in good shape. 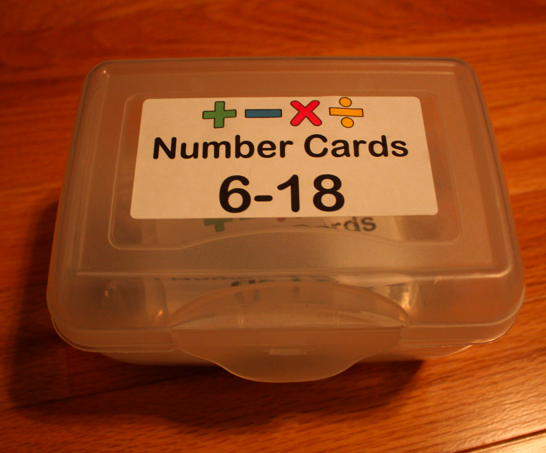 The games in Everyday Math require certain number cards for different games (in this image, the box is for the games that need number cards 6 through 18). 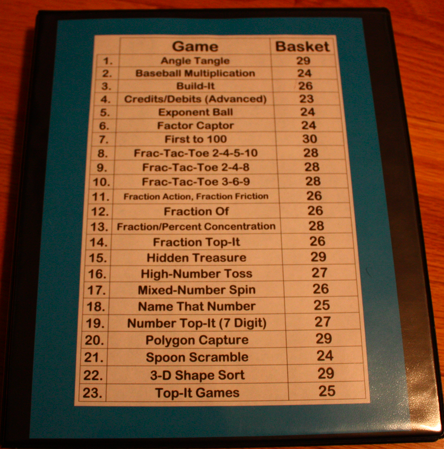 I went through all of the games in grades 2-5 and jotted down the different number card combinations needed. I bought playing cards from the Dollar Tree, since I needed more cards than provided in the math kit we received. Then, I put the playing cards in sandwich baggies, multiple sets within a box. 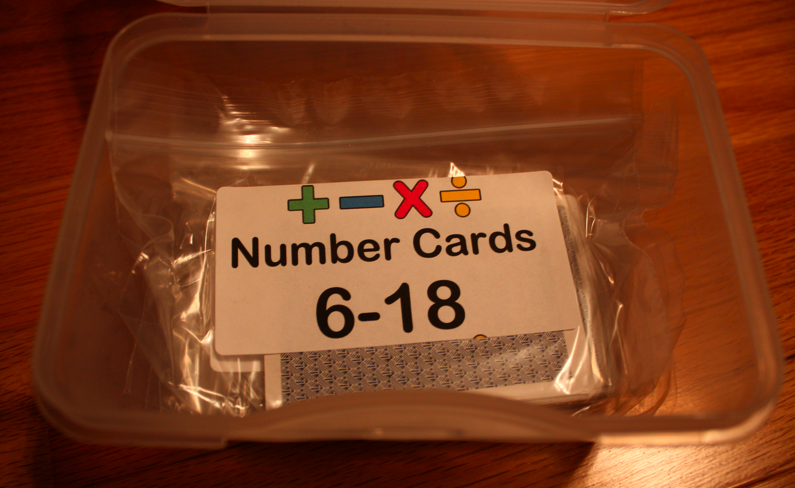 If you use Everyday Math and would like labels like these for your playing cards, please see below for the file. Click here to download the playing card labels. These will print on 2″ by 4″ labels. The game labels shared in Math Games Library, Part I show which number cards are needed. So when my students grab a game from the basket, they refer to the label on the game, then get the cards they need. This has saved us SO much time in sorting through entire card decks for particular number cards. I hope it can help you as well! Must-Haves for Reader’s & Writer’s Workshop! Can you post more about Everyday Math games? Where did you get it? I keep looking at a website that I think may be it, but it is for online games. It looks like to me that the games you have are printed and don't need online access? Thanks! Hey Caleb's Mama, the games came with the Everyday Math curriculum itself (we have a book to photocopy them from). this is a dream come true! I have been trying to get this organized for years with EDM and just could not wrap my brain around it! I LOVE your ideas THANK YOU!! I can't thank you enough for sharing this (especially for us new teachers). I would love a digital version of your Game table of contents and directions. hi kristen, am i able to purchase your actual games for the maths tables to go with all your cards etc? Is there a site or something I can get more information on the Everyday Math curriculum? Do you have the game directions available? Jacque, sorry, I don't–they come with our EDM curriculum. Thanks for visiting! Hello! I would love a copy of the game directions so we can know how to play them! Thanks. You rock! Kristen, do you have a digital file with the table of contents and game directions? My discount uses EDM but it would save lots of time if they were already typed up! LOVE the way you organized all the games! It'll make my life so much easier! My email is ledbetter2@marshall.edu if you have the digital file to share! Thanks! I would also love the digital file for the table of contents and game directions! A post with that information would be so helpful! Thanks! Hey our school uses EDM curriculum and if you wouldn't mind sharing I'd love a copy of your stuff beyond labels. I teach second grade and would like to use your templates to add first to the list. My kids aren't ready for the older games! This is my second year teaching and I'm struggling with the curriculum and getting my kids to master concepts. I hear the math games are the thing that helps the most and could use all the help I can get. Sorry, those are things that come with the series so I can't share them. Best of luck with your second grade class!